Peterborough is a midsized city located along thee Otonabee River in central Ontario. The CTP recommends that the City adopt an official Complete Streets policy to ensure that the transportation network considers all users of all ages and abilities. In Appendix G, the Plan presents a Draft Complete Streets Policy. 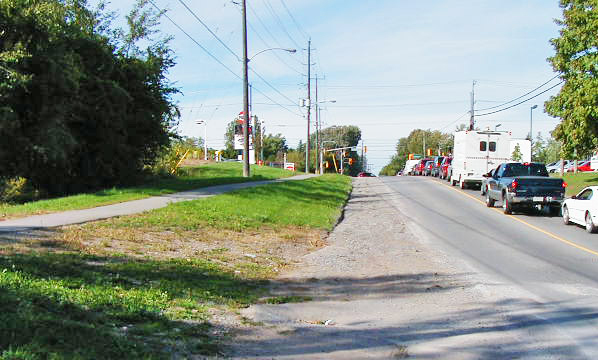 Brealey Drive in Peterborough was converted from a rural road with no sidewalks to a Complete Street, and it is one of nine projects included in TCAT’s Complete Street Transformations. 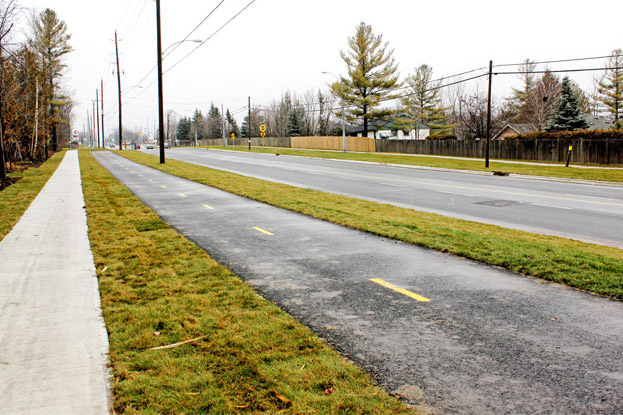 Once a rural road with no sidewalks, Brealey Drive now includes a fully separated bicycle trail, sidewalks on both sides of the street, as well as new crossings for people on bikes and on foot, allowing better access to major destinations along this increasingly urbanized street. The project cost $5.4 million, and took 9 years to complete (2006-2015), due to multiple modifications to the design. More improvements are planned further north along this street, past Lansdowne St. The project’s completion so close to the publication date of Complete Street Transformations meant that data had yet to be collected. Informal surveys by city staff, however, indicate that cyclists and pedestrians appreciate the new infrastructure.